Ordering information: If you cannot find or order these at your local shop, you can contact me to purchase directly at northernexpressionsneedlework@gmail.com and I will send you a paypal invoice. You can pay this via credit card even if you do not have paypal. Direct purchase is in PDF format. Please be advised that PDF purchases cannot be resold or transferred to someone else, they are for your use only. If you would like to purchase for someone else, please let me know in the message with the recipient's email address and I will send the chart directly to them. All prices are in US Dollars. My first design was released as a freebie. 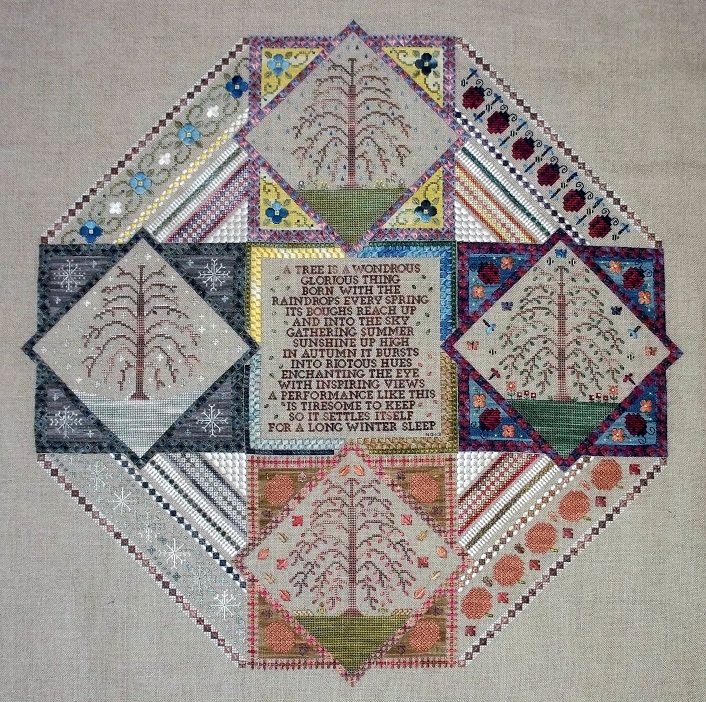 It was a sampler I designed as a gift to my mother, and after a lot of poking and prodding from some stitchy friends, I bundled the whole thing up, including my blog posts about it from an old blog which is now gone, and pdf'd it. 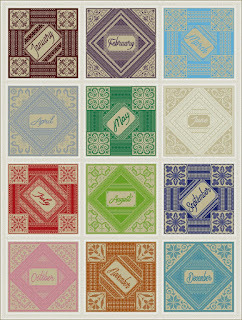 :) Click here to download the chart. Please remember this was my first attempt at any kind of charting, and to be honest, it was really only meant for me to stitch from, so there may be some errors. 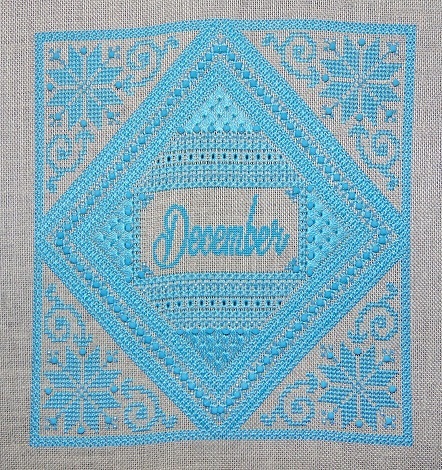 I stitched mine on Lakeside Linen in Magnolia, 40 ct, but you can use any count you want. Unfortunately, many of the colours I used in my own stitching were limited edition colours, some created specifically for this project, but as I always say, with a chart like this, you're limited only by your imagination - use whatever you love! 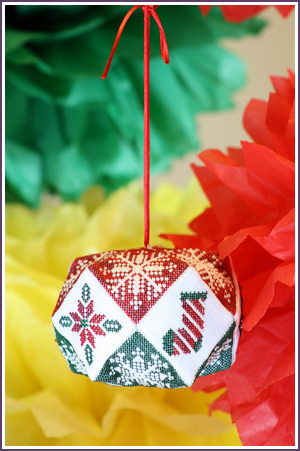 Many of the colours only use a small amount, so it would be a great project for leftovers. 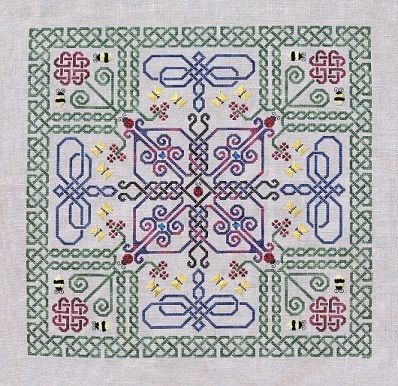 My first "official" design, after much more poking and prodding from stitchy friends, is Celtic Garden. 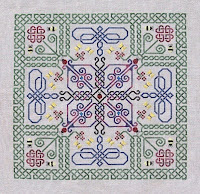 This is the first chart in the Celtic series of four designs (for now). The series is meant to represent my favourite things in nature, the things that inspire me and bring me peace. Flowers are a true favourite of mine, and someday when I own my own home, I will have gardens to rival my needlework designs, I'm sure. For now, all of my gardening is done with needle and thread. 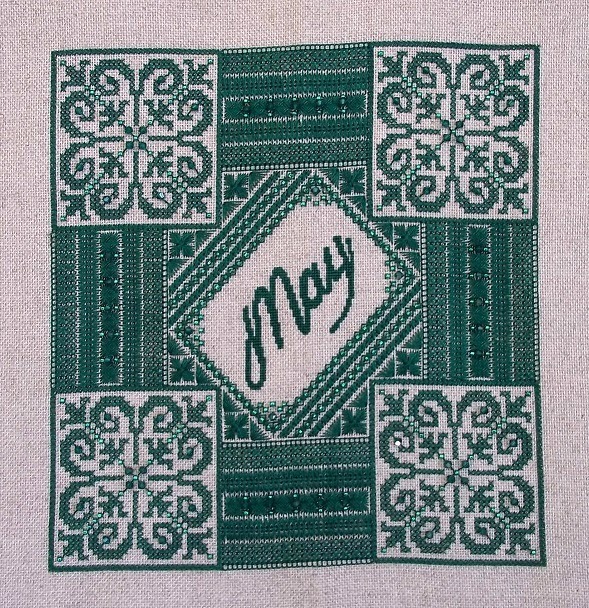 The design is stitched in a combination of cross stitch and specialty stitches, using Hand Dyed Fibers threads, on Sassy's Fabrics Golden Promise linen. 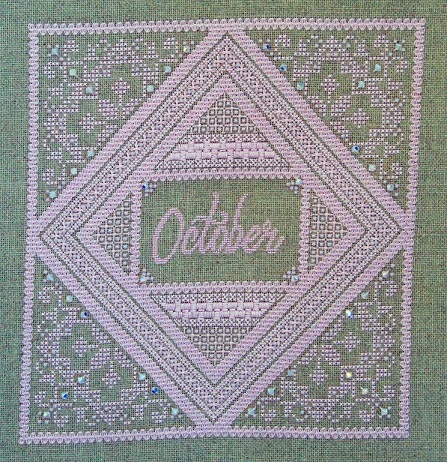 I generally stitch on high counts of fabric, I'm blessed with good eyes (though I do wear glasses) and I really love the delicate look of the little tiny stitches, so my model is done on 40 ct, however, you could use any count you're comfortable with, as long as it is suitable for over 2 work for the specialty stitches. Aida won't work here, you'll want evenweave or linen. 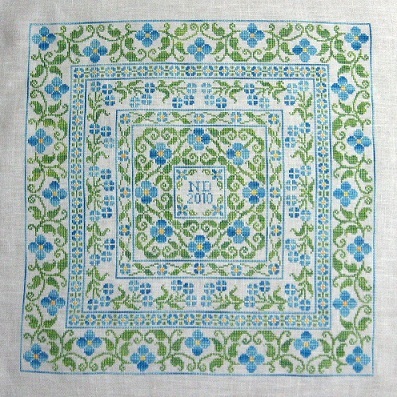 I have included a DMC conversion for those who don't like silk, and somewhere on my blog there is also a conversion to NPI that I did upon request from a needlework shop who stocked NPI. Next in the Celtic Series is Celtic Wings. Yes, there are flowers in this one too, but the winged creatures I chose to reprent in this design are most commonly found in gardens, so I had to give them some flowers to play with. :) The two main aspects of the design are the butterflies and dragonflies - my two favourite insects. Butterflies are a favourite because of their colourful beauty and their delicacy. Dragonflies on the other hand have a very special meaning for me. For several years, I worked as a landscaper, mostly for large industrial companies along the lake. My main function? Riding a tractor all day cutting grass. Many of the areas I used to cut, were around manicured ponds and man made creeks, and were infested with dragonflies. They kept me company many long, hot afternoons alighting on my shoulders, my steering wheel, heck I think I even came home with a few on my hard hat. This design is also charted for Hand Dyed Fibers in silk and silk chenille (for the little bumblebees), and includes a DMC conversion. The model was stitched on Sassy's Fabrics Frosted Cafe linen, again in 40ct. And again, you could stitch it on any count linen or evenweave you like. 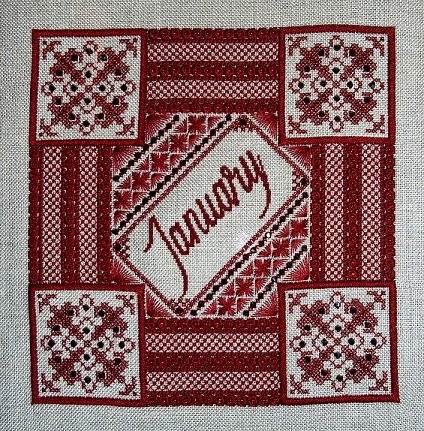 It contains several specialty stitches, but the bulk of it is cross stitch. 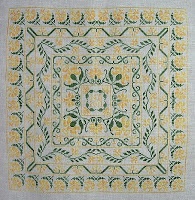 The third design in the Celtic series is Celtic Leaves. Living in Canada, autumn is a very colourful time of year. With the rains, the grass is at it's lushest and greenest, and the trees explode into a multitude of oranges, yellows and reds. 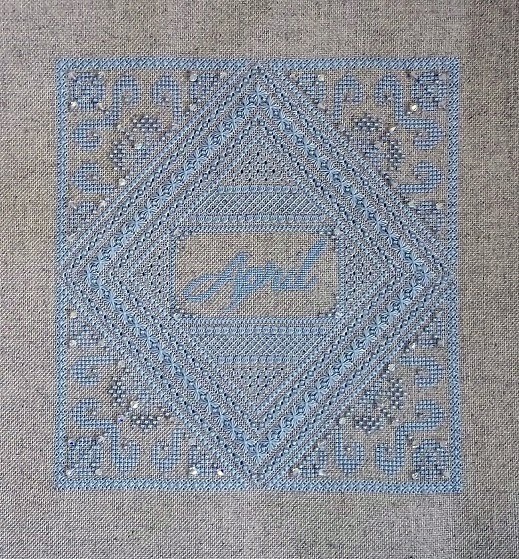 This design was a labour of love - the materials for it kept getting lost in the post, and I was fighting against a deadline, so it made for many nights of stitching into the wee hours, and I managed to stitch it in a couple of weeks. 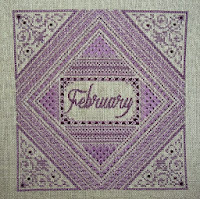 It is stitched in five colours of Gloriana and 3 colours of Belle Soie, on 40 count Magnolia from Lakeside Linen. Any count will work, but again, you'd need to use a linen or evenweave fabric as this one is predominantly specialty stitches. 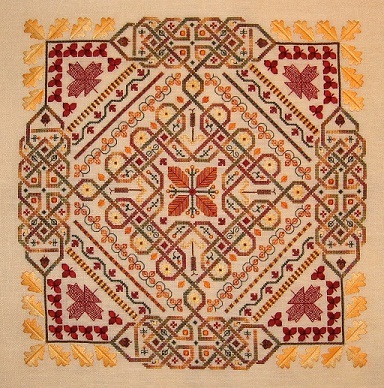 The knotwork is about the only thing that is pure cross stitch. The chart includes a DMC conversion, though I have to admit, this was difficult to convert. 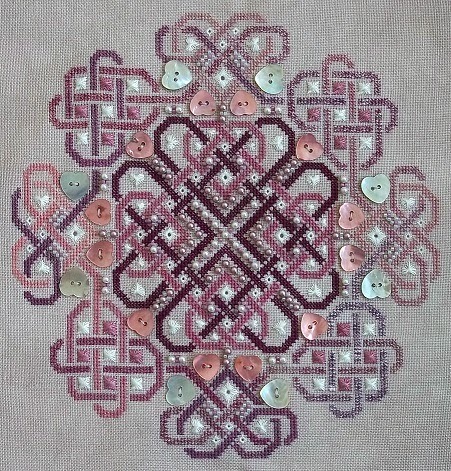 There just aren't very close matches in the DMC palette, and the knotwork is done in three very heavily overdyed colours. I did my best to pick what I thought would work, but it really isn't at all close for these three colours. I have since done conversions to overdyed cottons and other brands of silk for people which are much better than the DMC, but I know a lot of stitches like to have that. Fabric Used: Hand Dyed Fabrics by Stephanie, Midnight Tryst, 36ct. 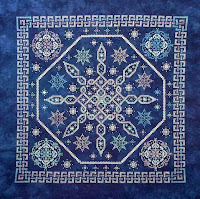 The fourth design in the Celtic Series is Celtic Snow. I first started designing this back in 2009 when I was working on the others, but it just wouldn't come to me. FINALLY it's done, and it feels like a major accomplishment. 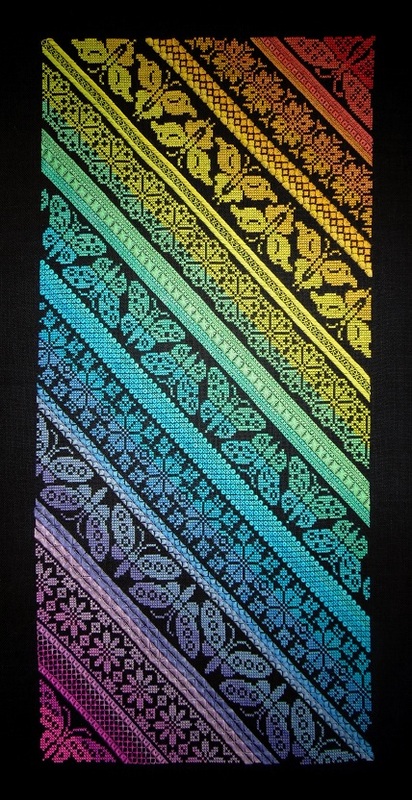 :) The design is a combination of cross stitch and a few specialty stitches, beads and crystals. I was aiming for the look and feel of moonlight glinting off of freshly fallen snow and I hope I nailed it! It's very sparkly! 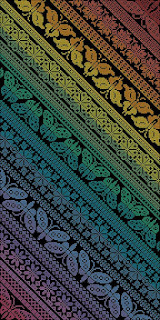 Threads Used: Dragonflylotus Designs - DMC or Dinky Dyes conversions supplied. 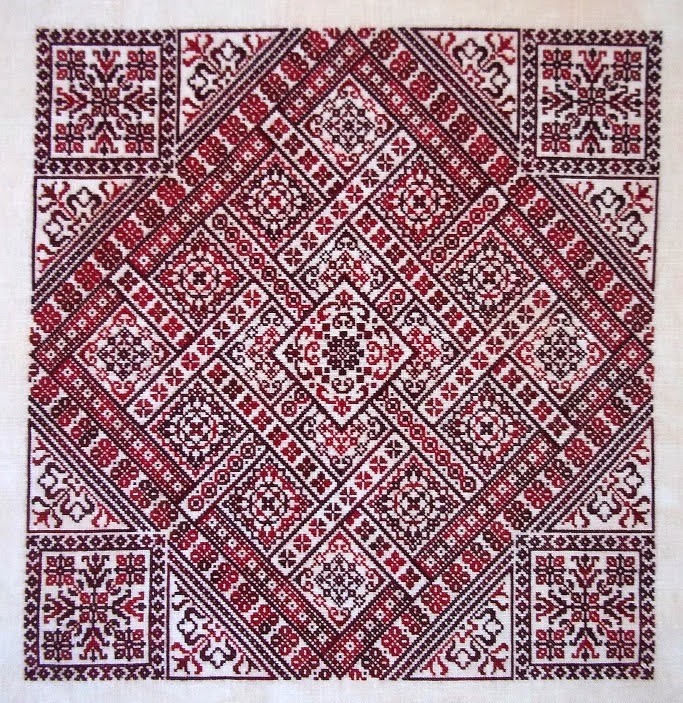 The design can be stitched on any count of linen or evenwave, though the buttons and beads won't fit 40ct very well (you could always sub smaller beads or specialty stitches in place of them). The buttons will actually fit better on 32ct, but I already had the 36ct here. Dragonflylotus Designs also does a heavier weight thread in these same colours that covers beautifully on 28 or 32ct fabric. Fabric Used: Lakeside Linens Light Examplar, 36ct. Hearts Entwined features hearts, hearts and more hearts. Each section explores different specialty stitches, textures and effects. 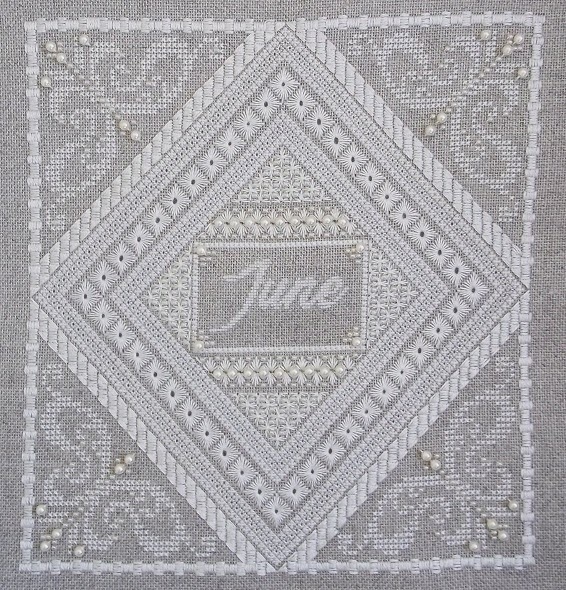 The chart includes a section on customizing the design to use as a wedding or anniversary sampler. I had a lot of fun with this piece, playing with lots of different stitches, though I have to admit, drawing all of those diagrams took a very long time. 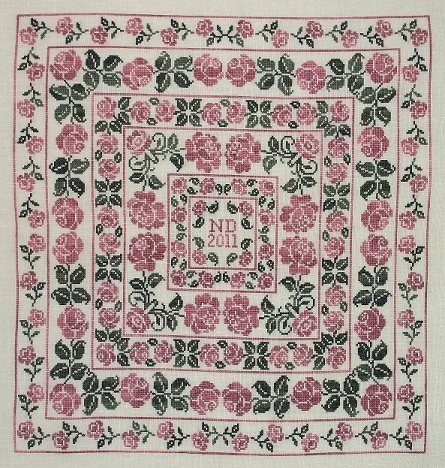 The design is stitched in 2 colours of NPI silk floss, 1 colour of Gloriana Silk Floss and one colour of Gloriana Princess Perle Petite. I have included a DMC conversion with the chart, however I have to stress that the colours, though somewhat close are not exact - conversions rarely are. I stitched mine on 36 count, but you could use any count of linen or evenweave you want. I hope you like eyelets, you'll stitch a lot of them on this design! Fabric Used: Lakeside Linens Magnolia, 40ct. 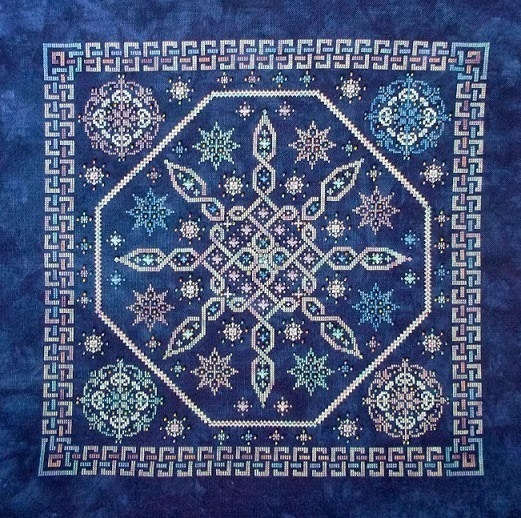 Forget Me Not is the first in a series of nine geometric floral designs. 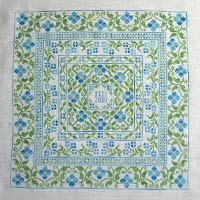 As indicated by the title, this design features the forget me not - and uses 3 colours of Gloriana Silk Floss. I have included a DMC conversion, though of course, it is not exact. With a design of this nature though, I always encourage stitchers to experiment with different hand dyed threads and find a colour scheme you love! 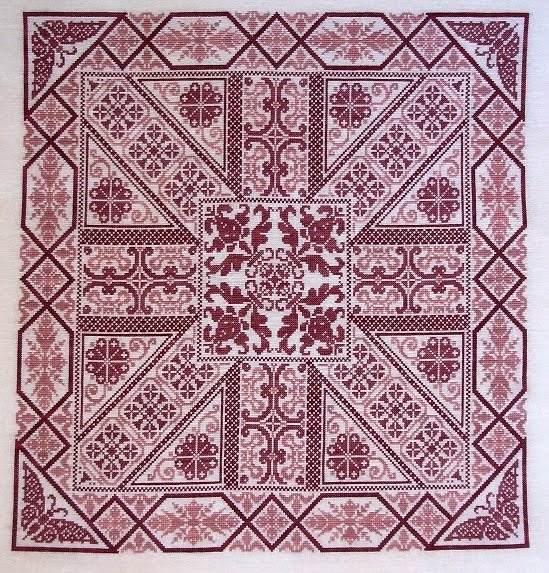 Because the design contains only cross stitch, it is suitable for any type of fabric you like. Daffodil is the second design in the geometric floral series. The design uses 2 colours of Gloriana Silk Floss, and though I have added a conversion to DMC, I urge people to pick colours that speak to you. There are so many wonderful threads out there, I picked the two I loved, you should do the same! 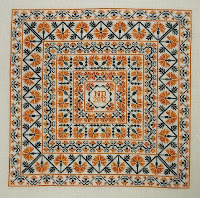 The design is all full cross stitches, so any type of fabric is suitable. Daisy is the third design in the geometric floral series. 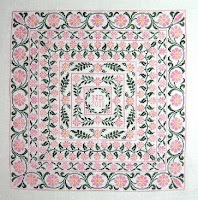 The design uses 3 colours of Crescent Colours Belle Soie silk floss. I've added a DMC conversion, but it's not exact - there just isn't a green that's close, especially with the wide shade range in the variegated I used. As always, use what you like best!! 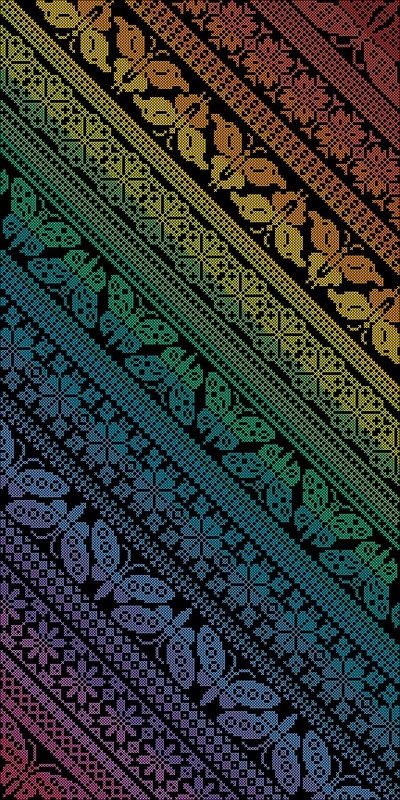 This design is entirely cross stitch, so it's suitable for any type of fabric. 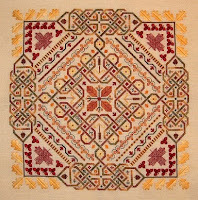 Tulip is the fourth design in the geometric floral series, and is featured in the March/April 2012 issue of Just CrossStitch Magazine, photo courtesy of same. The design uses two colours of Crescent Colours Belle Soie Silks floss. 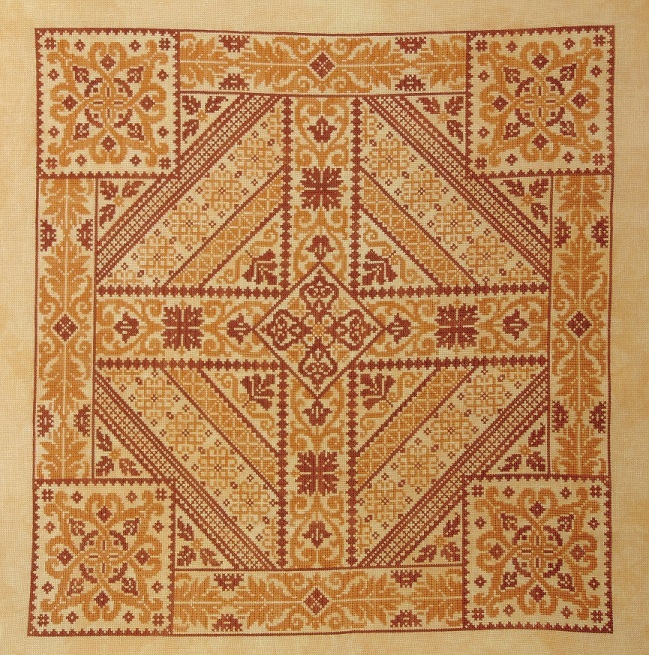 The design is entirely stitched in cross stitch, so you can use any type of fabric you like. 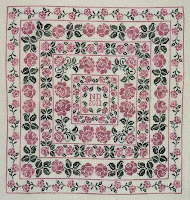 Rose is the fifth design in the geometric floral series. 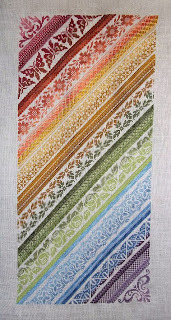 It uses two shades of Crescent Colours Belle Soie silks, and includes a conversion to DMC. As always conversions are never exact. 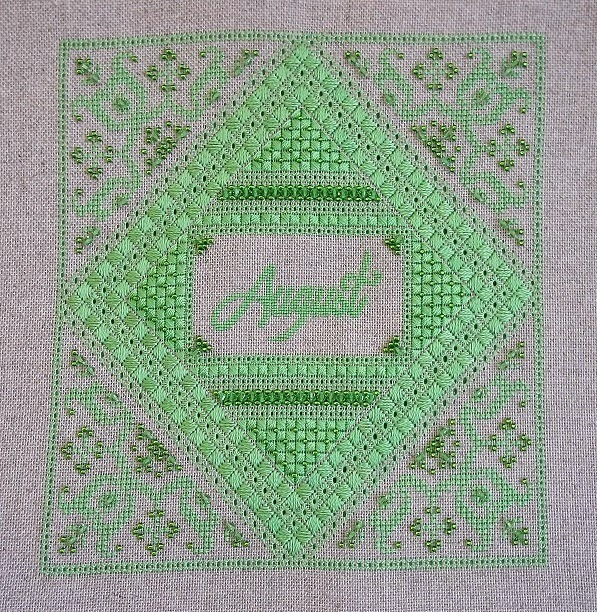 The design is stitched entirely in cross stitch, so you don't have to use linen, you could use any fabric of your choice! 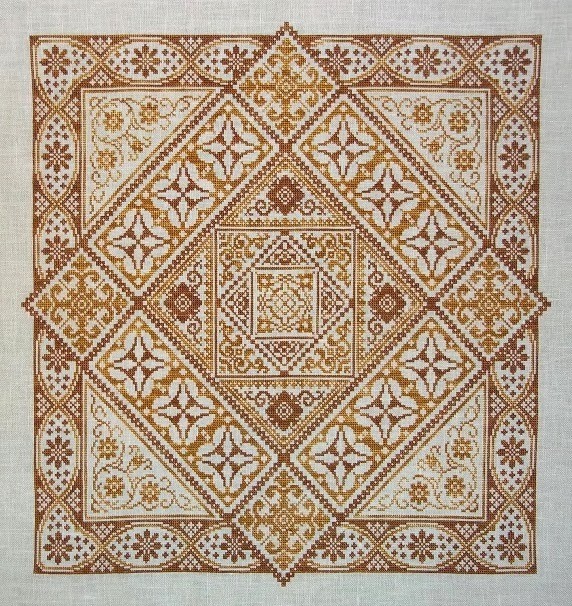 Marigold is the sixth design in the geometric floral series. It uses two shades of Crescent Colours Belle Soie Silks and as always includes a conversion to DMC - though conversions are never exact, and dye lots vary! 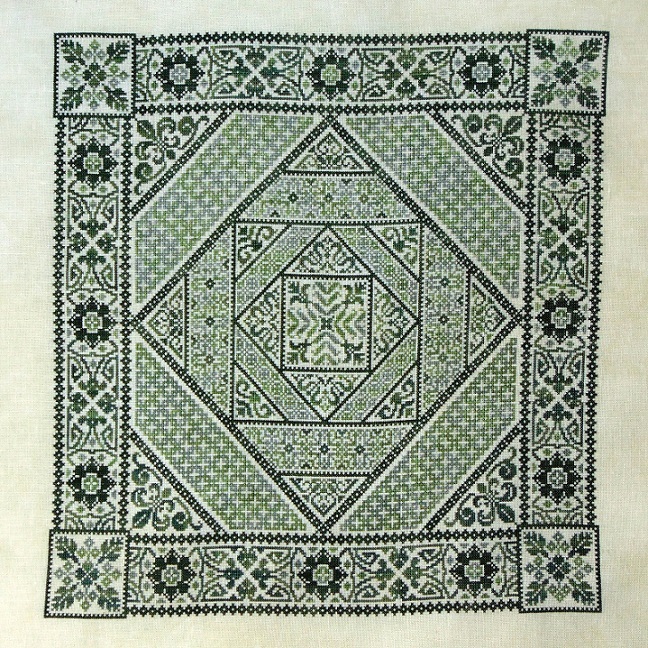 The designs is all full cross stitches, so you can stitch it on any fabric of your choice. Antique Lace is a design that has been about two years in the making. The original idea for it came from an antique filet crochet table centrepiece with the basket of roses motif. 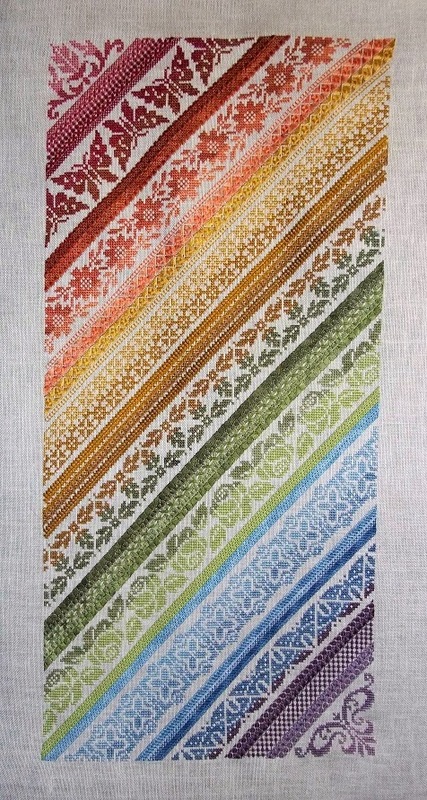 Later, when researching ideas for the lace bands, I came across the same motif in a collection of designs from antique samplers. 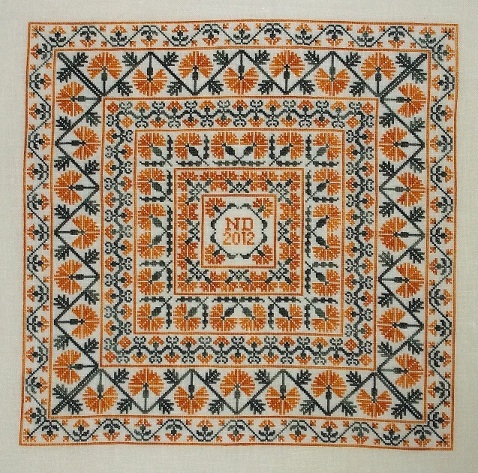 Whether the motif originated in cross stitch or crochet I have been unable to find, but I was intrigued at the cross over between the two styles of needlework. 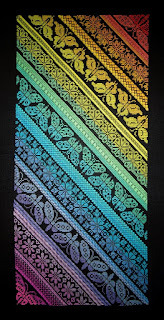 The “lace” bands were designed to mimic different styles of lace, inspired by antique cross stitch designs, crochet designs, and lace trims and edgings. Fabric Used: Sassy's Fabbys Crescent Cream linen, 32ct (as shown), Weeks Dye Works Parchment (sampler colourway). 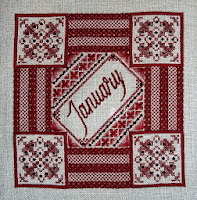 This design was originally published in The Gift of Stitching Magazine in 2011, but now is available as a chart. 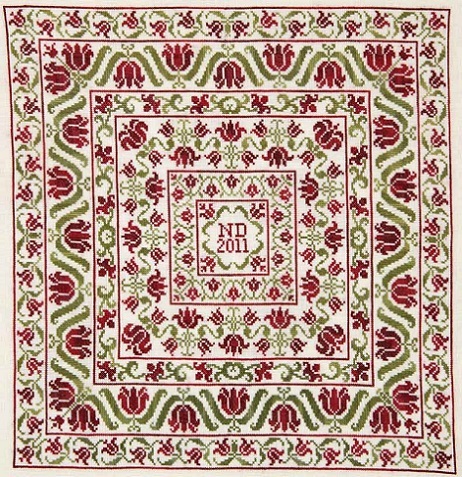 The chart includes two different colourways, one in bright floral colours as shown, the second in a more muted, aged look. Both use Carrie's Creations Silk Floss and as always a DMC conversion is given. 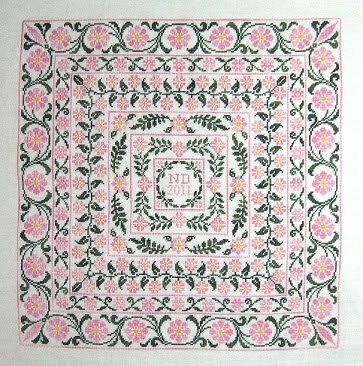 The design is entirely cross stitch, however because some is over one and some is over two, linen or plainweave fabric is necessary. Fabric Used: 34ct Wren Wing from Legacy Linen - alternate colours - Flax or Natural in your choice of count. 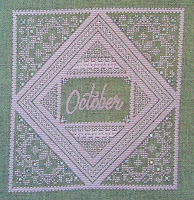 Stitches Used: Combination of cross stitch and specialty stitches, diagrams for all stitches included in this 37 page booklet. This design almost didn't make it to the finish line. 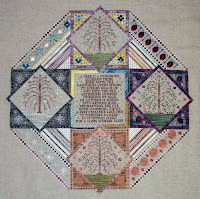 This is the last design of mine that my dad ever saw, I started model stitching it just before we found out he was dying. I finished it as a tribute to him. 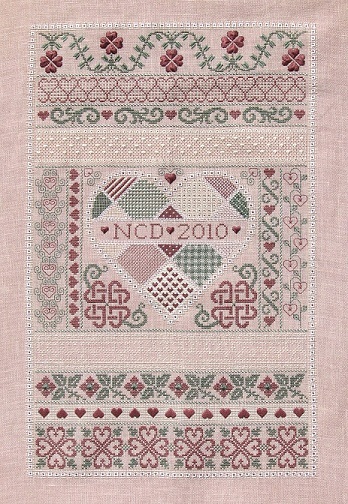 Stitches used: Combination of cross stitch and specialty stitches. Diagrams for all stitches provided in this 22 page booklet. Okay, I admit I'm biased, but I just love the rich colours in this one. :) I can also picture it in so many different colour schemes! A softer more muted palette, a brighter more vibrant palette or even in multiple shades of the same colour could be very cool! Recommended Threads: Au Ver a Soie - Soie D'Alger. DMC conversion provided. Stitches Used: Cross Stitch Only. I was approached by a group of stitchers who wanted to stitch the Twisted Band Sampler, but didn't want to do the specialty stitches, so I came up with this alternative. 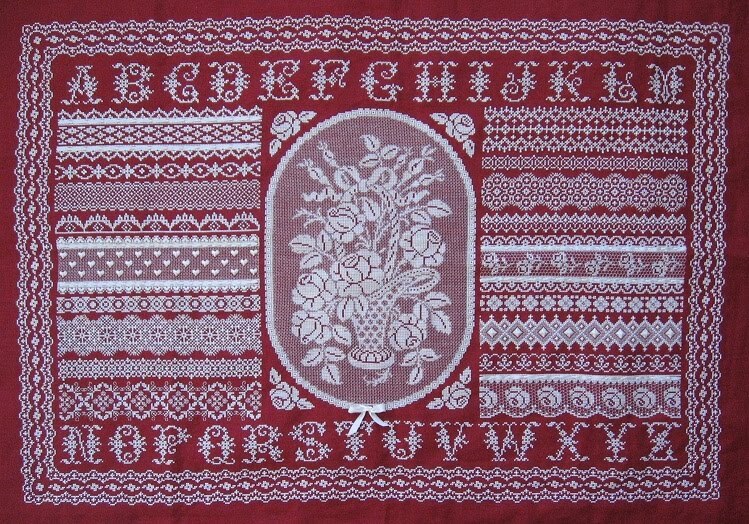 I tried to match the patterns made by the stitches so that you will still get a similar effect. This version of the design is only available in PDF format, either directly from me, or from my etsy shop. Recommended Threads: Threadpickerz Silks with a conversion to Dinky Dyes and DMC. Recommended Fabric: Weeks Dye Works Onyx 32ct. After seeing the stunning colours that Eileen from Threadpickerz chose to stitch her Twisted Band Sampler in, I just had to design a follow up piece to use them on. The colours are so vibrant and lovely! 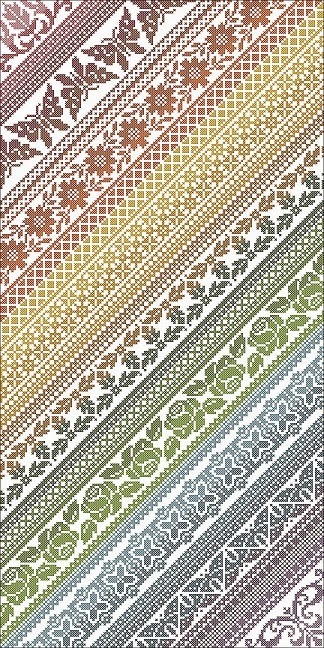 Like it's counterpart, Twisted Band Sampler, I released this one as a cross stitch only chart for stitchers who do not like or want to do specialty stitches. I tried to match the patterns of the bands so that it would still have the same feel overall. This pattern is available from my Etsy shop. 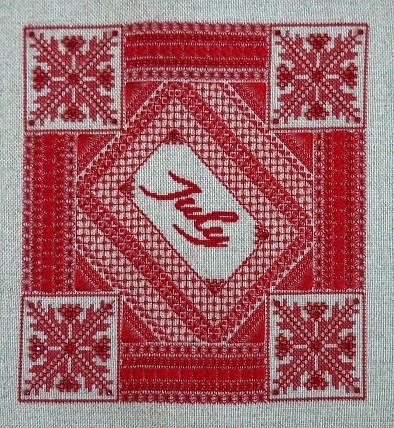 Bead packs will be available from European Cross Stitch. 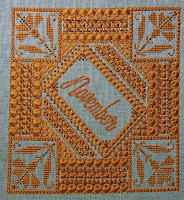 Stitches used: Combination of cross stitch and specialty stitches, diagrams for all stitches provided in this 14 page booklet. 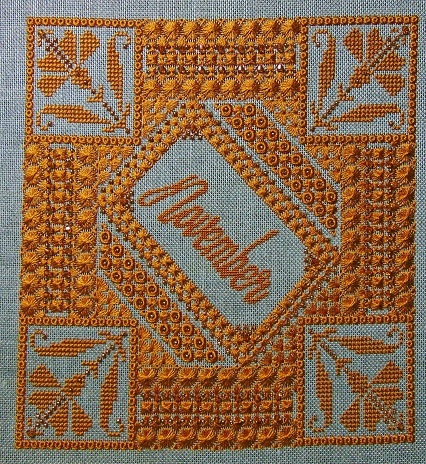 Stitches Used: Combination of cross stitch and specialty stitches, diagrams provided for all stitches in this 14 page booklet. Stitches Used: Combination of cross stitch and specialty stitches, diagrams for all stitches provided in this 12 page booklet. 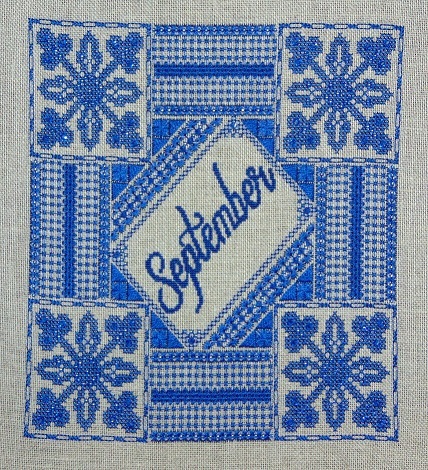 Stitches Used: Combination of cross stitch and specialty stitches, diagrams for all stitches provided in this 15 page booklet. 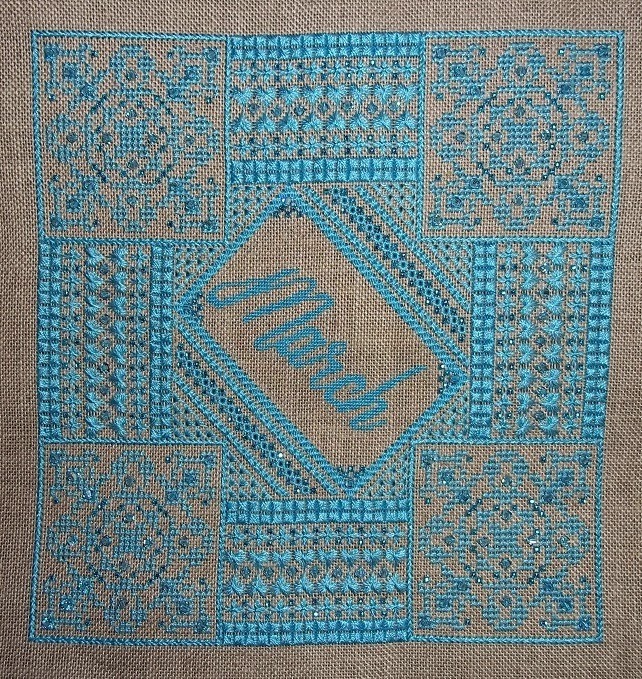 Stitches Used: Combination of cross stitch and specialty stitches, diagrams for all stitches provided in this 11 page booklet. 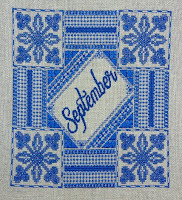 Stitches Used: Combination of cross stitch and specialty stitches, diagrams for all stitches provided in this 12 page chartpack. Stitches Used: Combination of cross stitch and specialty stitches, diagrams for all stitches provided in this 13 page chartpack. 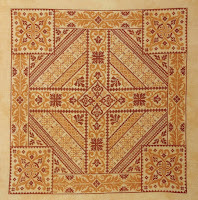 Stitches Used: Combination of Cross stitch and specialty stitches, diagrams for stitches provided. This 164 page book includes all 12 birthstone charts both individually and charted together as shown with decorative borders. This is offered as a PDF only, at 40% off the individual purchase price of all 12 charts. Shades of Wine is the second in a series of twelve shaded designs featuring bands and motifs shaped into geometric patterns. 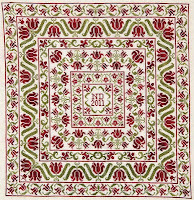 Shades of Red is the third in a series of 12 shaded designs featuring bands and motifs shaped into geometric patterns. 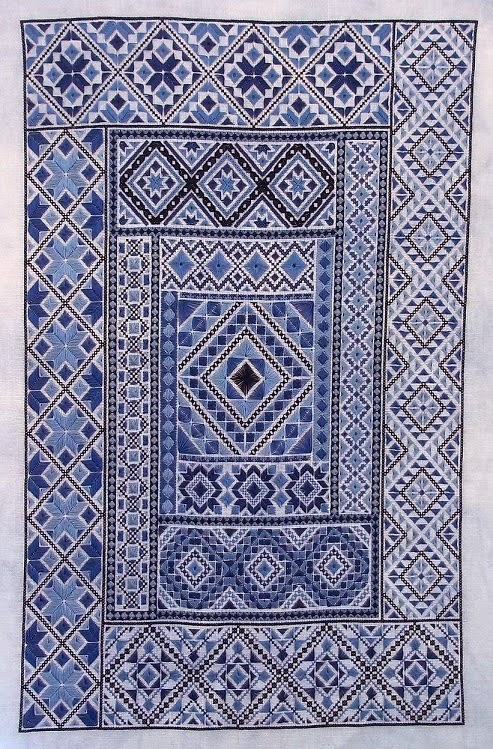 Shades of Blue is the fourth in a series of 12 shaded designs featuring bands and motifs shaped into geometric patterns. Shades of Orange is the fifth in a series of 12 shaded designs featuring bands and motifs shaped into geometric patterns. 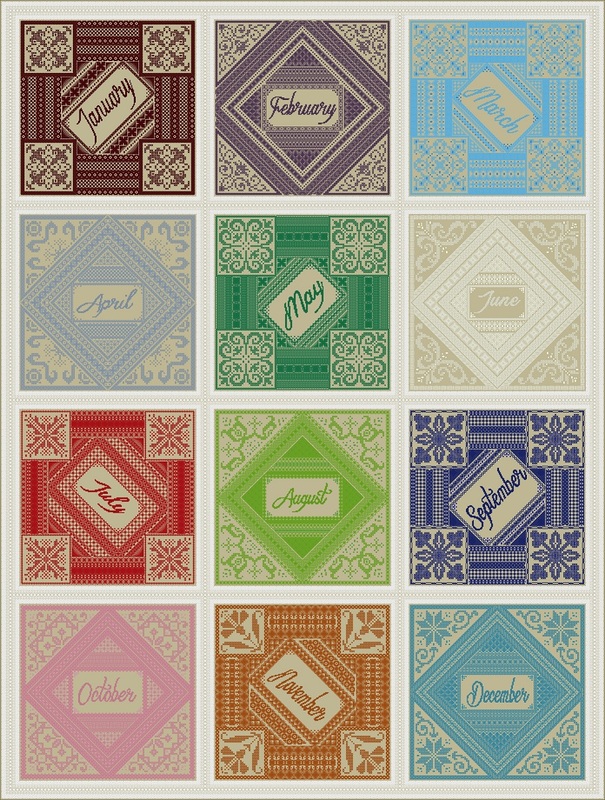 Shades of Rose is the sixth in a series of 12 shaded designs featuring bands and motifs shaped into geometric patterns. 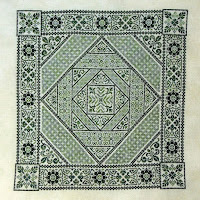 Shades of Green is the seventh in a series of 12 shaded designs featuring bands and motifs shaped into geometric patterns. 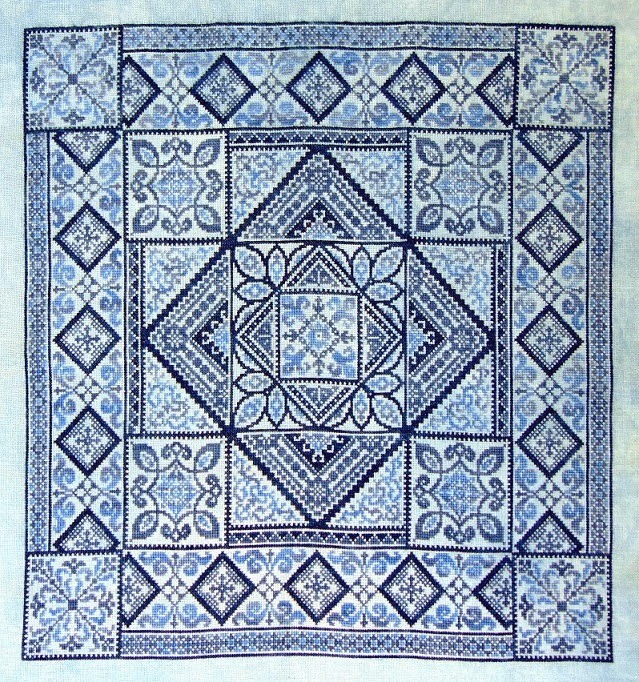 Stitches Used: Cross Stitch and multiple specialty stitches. 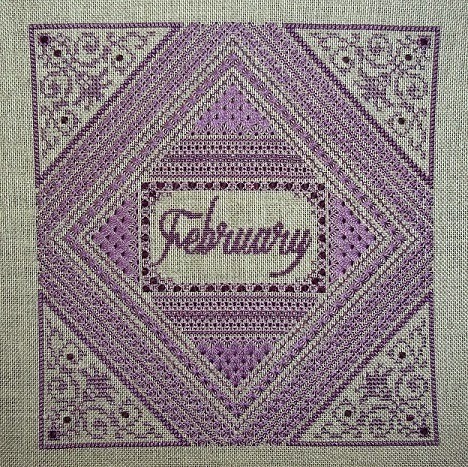 The Learning Sampler was originally an 18 part Stitch Along project that finished up earlier in 2015. I've had so much positive feedback and inquiry about the project that I've decided to re-release it as a single chart project. 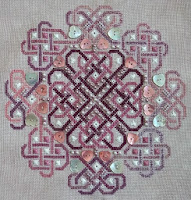 The project was designed as a way for beginners to learn and practice different types of specialty stitches, so the instructions and diagrams are a bit more in depth than they would be on one of my normal specialty stitch charts, as they assume that this is the first time you've attempted these stitches. The project is suitable for any level of stitcher from beginner to expert. 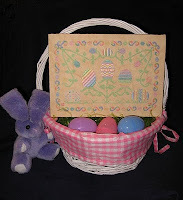 Stitches Used: Mostly specialty stitch with 40 diagrams and instructions included in this 31 page booklet. Re-release Date: Has been re-released as a free design in my Facebook group. Design Size: Stitched area is 175w x 105h - this includes the space left around each square for cutting and assembly. Other Materials: Buttons for top and bottom, model uses JABC 4415L Large Peppermint. Also ribbon, trim or cording to make the hanger. 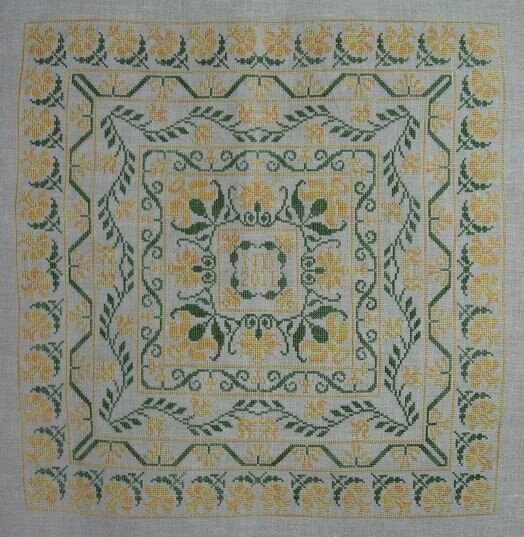 Fabric Used: Zweigart Belfast Linen in White - 32ct. 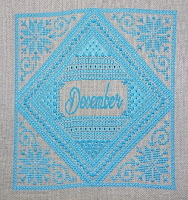 This design was featured in The Gift Of Stitching November 2011 Ornament Issue, photo courtesy of same. For this design I wanted something different. I'm not a finisher, so it had to be something fairly simple to assemble. The design is surprisingly easy to put together, with loads of different ways you could embellish! I included a conversion to DMC, Kreinik and Mill Hill.